The World Is Talking. Are You Listening? January 30, 2010 – Co-hosted by Frontier Foundation, NeTivism.com, and Dharma Drum University - School of Philanthropy, the “Social Translation” forum invited Mr. Leonard Chien, project manager of the Global Voices translation project, and Mr. Ray Peng, chief editor of Taiwan Environmental Information Association, to share their experiences managing open translation projects. “Social translation” movement aims to bridge the knowledge gap and to enhance social benefits through free and open source translation projects. Global Voices is Incorporated in the Netherlands, Global Voices is a nonprofit foundation that work with hundreds of bloggers around the world that share translations and reports from blogs and citizen media everywhere, with emphasis on voices that are not ordinarily heard in international mainstream media. Leo pointed out that background knowledge, technique and language skills are all essential for good translation. 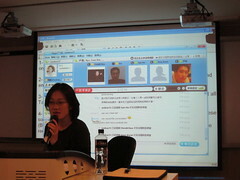 Currently there are about a hundred and twenty volunteers participating in this worldwide translation plan, and about ten of them are responsible for the Chinese translation. 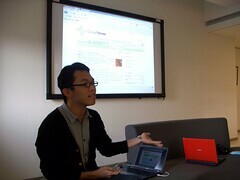 In order to promote the continual support and enthusiasm from the volunteers, a considerate amount of time was invested by Leo to make them “feel good.” Not only that a very easy to use translation platform was constructed with the help of Wiki, a solid support system was also established for the translation and the editing process. In addition, the interaction between the volunteers was encouraged, as well as for the appreciation for the translators from the writers of the original news. 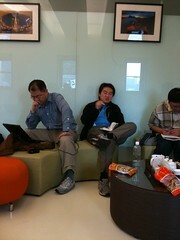 Furthermore, links were provided for translation to other languages from the news articles in the Global Voices. 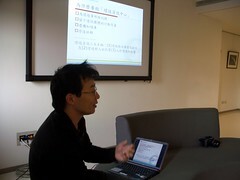 Mr. Ray Peng emphasized that the function of the Environmental Information Center was “for information to lead to concerns and for concerns to action.” When the Taiwan Power Company proposed an expansion at the Da-Lin Plant, the data through translation by the Center from research abroad stated that air pollution increased the incidence of cardiovascular diseases. This kind of information could to be useful for the environmental groups in advocacy. 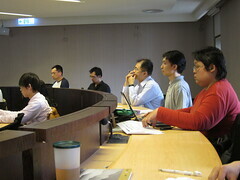 Social translators from the Institute of Information Science of Academia Sinica, the Himalaya Foundation, the Institute for Information Industry, the Department of Information and Tourism of Taipei City were also in attendance to share their experiences of providing or managing open translation projects. 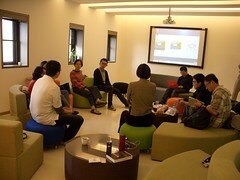 For examples, the Himalaya Foundation provided services for the International NPO News, and TED (Technology, Entertainment, and Design) provided open translation projects. TED has an extensive collection of great speeches in digital format from the world’s leading experts on various subjects. With the presence of on-screen English subtitles, the translators could easily convert them into Chinese or any other language. For people who care about the events of the world along with volunteers in other countries, the open source translation projects by Global Voices, Environmental Information Center, Himalaya Foundation, TED and other NGOs are the best choices to be involved in. This event was one of the “Net Tuesday” monthly events organized jointly by Netivism.com, Frontier Foundation, and Dharma Drum University — School of Philanthropy. Net Tuesday was initiated by NetSquared.org with the goal “to connect for all those interested in the intersection of social technologies and social change. For NetTuesday monthly events please visit: http://net2.netivism.tw/about. View more documents from frontiertw.